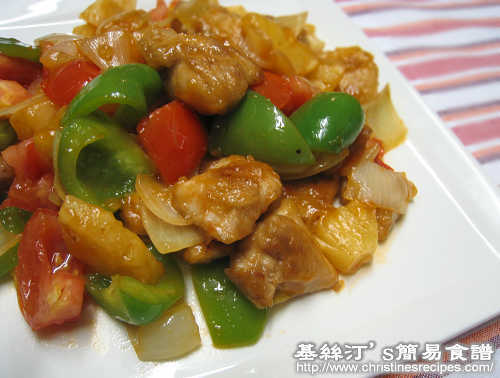 Sweet and sour sauce is a kind of versatile sauce, going very well with any kind of meat, like pork, beef including chicken of course. This dish, pan-fried chicken in sweet and sour sauce is perfect for going with white rice. You can deep fry the chicken if you like. This time I just pan fried the chicken for saving the oil, good to health as well. Rinse chicken and pat dry with paper towels. Cut into bite-sized chunks. Marinate for 1 hour. Cut onion, capsicum and tomato into pieces. Set aside. Slightly coat marinated chicken with cornflour. Fried over medium-high heat until both sides are brown and cooked. Set aside. 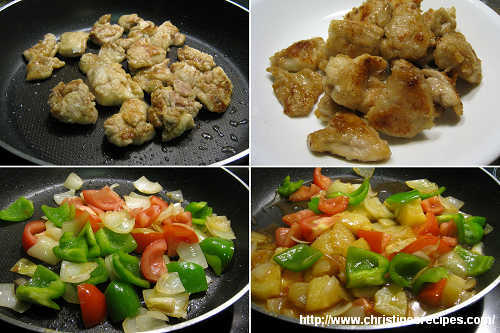 Add 2 tablespoons of oil in a wok or frying-pan. Sauté onion and garlic, add capsicum. Add tomato and 2 tablespoons of water, cook for 2 minutes, or until all ingredients are softened. Pour sweet and sour sauce, add pineapples and bring to a boil. Toss in chicken and stir well. Sprinkle salt to taste. Add thickening and cook to your preferred consistency. Dish up and serve hot with rice. Your Sweet and Sour Chicken is looking good. Pan Fried is good as less oil. I will try this dish. I really love your tasty dishes, and they look really colorful. I just wanted to share a place that I found on the internet. I'm not sure if you seen it lately since they have great Chinese information on food, utensils, and culinary cooking techniques. Take a look at http://www.wokfusion.com/blog. See if you like when you have a free time. MMMMM..i like excellent dishes like this: healthy & so tasty! Can serve 2 to 3 people.